Analytics Done Right in WordPress with "Analytify Plugin"
It’s always been a matter of fact that every developer or admin want’s complete statistics of their website to analyze the behavior and priorities of his site users. However, this may become complicated when there are numerous products available in the market with different features available. Similar is the case with Analytic companies which are increasing in number every other day and I believe that almost everyone comes across to Google Analytics somewhere in their development stage as it is being considered as one of the top tracking pixels available in the current scenario. WordPress is now the most used platform in the world for developing blogs and even CMS websites. This is a review of one of the best analytics plugin used on WordPress sites which changed the way how we track and look at behavior and priorities of our users. Last year, WP Brigade had launched an analytics plugin named “Analytify” to make Google analytics simple for the WordPress sites. This is the most advanced plugin available in the WordPress market yet. No other plugin can offer you the same or even similar features with which this plugin is equipped with. It comes in two variants “The Free Version” and “The Paid Version“. The Paid version starts from $29 and the license can be extendable to “Small Business – $49, Agency – $99, Developer – $199. Now, have a look at some usage and installation instructions along with features of this plugin. I am using Pro Version in this review, however, you can try the free version as well. Step 1. You have to download the plugin from the WordPress Plugin Repository(For Free Version) or from Analytify website (The Paid Version). Step 2. Upload the plugin to the Uploads section of Plugins by navigation to Dashboard >> Plugins >> Add New >> upload and then activate it. Step 3. 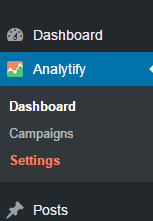 After activating the plugin, you will come across a new screen with the title”Welcome to Analytify”. It will contain Plugin info along with new version details and “Getting Started” Instructions. Read the instructions carefully before proceeding. Now, let’s get ready to authenticate your Analytify Pro License key. This step is valid only for Pro users. Free version users can safely skip this step. To authenticate, get your license key from Analytify site and put it on the License tab available on the settings page of Analytify menu. After authentication, you are now entitled to auto-updates and can use this plugin freely. Step 4. After completing authentication, we are now going to verify Google Analytics account with it. Do remember that you have to add the site manually to your Google analytics account before verifying and after verification completed, you have to choose your current site from the Analytify plugin. Please check the screenshots below for better understanding. Congratulations, you are now done with Installation, Authentication and Verifying Analytify Plugin for Google Analytics. Let’s have a quick view of its awesome features. The key features of Analytify plugin include its simplicity to use, view, fetch and presentation of site analytics on both frontend and backend of WordPress. The data is displayed in a very simple way which is understandable to any WordPress user. There is an Analytify Dashboard which gathers the information of all Google Analytics data in one page. It gives a clear statistical view about the number of sessions, number of users, number of page views, how many new sessions are in progress, what is the average time spent by each user on that page etc. Check out the screenshot below. The WordPress user will get statistics per page or per blog post. This includes the data of the users from which country they have logged in, which browser they’re using, what are the most searched keywords which are leading to your WordPress page, general statistics data for individual blog’s, the total number of page-views and exits. There is a feature to identify whether the user is a new user or a returning user, this gives the administrator an idea as to how far the blogs or pages are impressive. Analytify plugin has both universal tracker and traditional tracker available. The WordPress user has an option to choose between traditional or (universal Tracking code). These pages are also linked to social networking sites and social media stats help the admin identify how many users are coming to the site from social media networks. The browser stats list the usage of top five browsers. Reference stats provides the admin the list of strong refers to your site. Also, there is a comparison statistical graph about what happens when a user visits your site. Analytify is compatible with multisite networks. The stats data can be viewed on many screens (Responsive) or sites from various devices. Access control is one of the key features of Analytify plugin. You can grant access to certain roles to view analytics of your site. There are many websites which collect data from various writers and publish them. The analytics data cannot be shared among all of them. The employer would like to restrict the access to these data stats. For this, the admin has to go to the analytify plugin settings and select ‘admin’ option. It will show a dialog box with a description, “show statistics to” and the user can customize it. This is a recommended tool for all the WordPress admins. When it comes to statistics for wordpress based websites, Easy Stats is the right solution..
Hi Stefan, I am sure Analytify got a lot more. I will try the above mentioned Plugin as well. Though it’s paid.